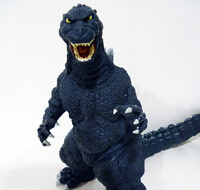 The first in what is shaping up to be a long line of banks on the Godzilla franchise from Diamond Select Toys. This full figure bank is impressive to look, being both tall and very long with a snaking tail. Its impressive to hold, but sadly comes with one over arching fault: assembling it. 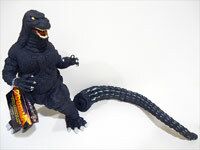 Based on one of the most popular Godzilla designs, this figure bank is imposing to look at. 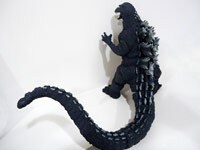 It measures a crazy 18 inches long, from head to tail end, and measures another 12 inches in height. It is, for its size, relatively light. This is the be expected given the hollow, vinyl aspect of the bank. The detail placed into the figure bank is also fantastic. The dorsal fins look great, as do the many scales that cover his entire body. 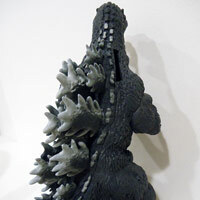 Variety is given to the design as well with a different folds found on its neck and nice crease marks given to the monster's massive weight around his legs. The face is also well done, even including this version's famous double rows of teeth. The paint job is good, although has some small areas for improvment. First and foremost, the claws look a little simple, all being a single shade of gray. It would have been nice to see a graidant on them, or at least some more detail placed here. The teeth also look a little simple, like the paint was applied liberally to this area. The eyes themselves look okay, although their large white pupils look more like the suit from Godzilla vs. Mechagodzilla II (1993) rather than the more squinty eyed version seen in 1989. On the bright side, the paint job on the dorsal fins looks flawless, and really well done. The bank comes packaged in two giant plastic bags. One contains the figure base with a tag around his arm, and the other contains the tail. To assemble the tail, you place the two prongs at the base and line them up with the hole in the bank. There is a white line on one of the prongs that should be aimed up with the hole with the white line in it as well. Apply a lot of pressure, twist and they are assembled... in theory. I attempted to attach the tail for hours, running Mill Creek's Godzilla The Series DVD in the background while I tried again and again (multi-tasking for the win). I could never get it on. Diamond Select Toys created this YouTube tutorial for assembling the tail, meaning feedback has probably been loud since it released. Sadly, even following the guide, which basically echoed what I had already attempted, the tail would simply not come on. I have read other reviews with people of similar strifes, and wager there are just a portion of them that are defective with tails that will not attach. Overall, the figure looks great and the detail placed into what is effectively just a bank is great. It would make for a great center piece for a collection. However, I have to dock points for the troublesome tail. I have no way of knowing if there is a very small number of defective units that just happened to get into reviewers hands, or if its a more widespread issue. Regardless, after pruchasing yours I suggest attaching hte tail is the first thing you try before removing the tag just in case. In closing would also like to thank Diamond Select Toys for sending this in for review. Here is a direct link to the listing in their web store as well.